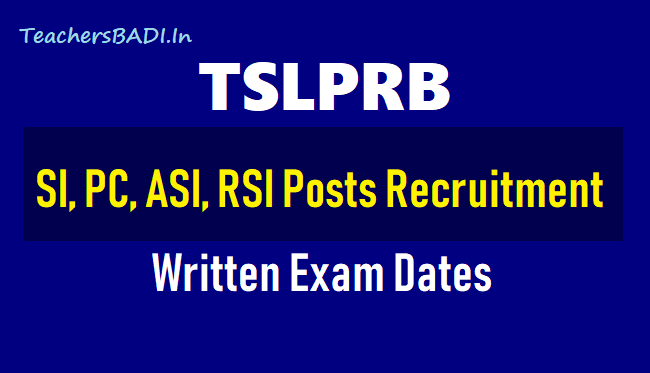 TSLPRB SI, PC, ASI, RSI Posts Written Exam dates 2018 (Preliminary): The Telangana State Level Police Recruitment Board announced the SI Sub Inspector and PC Police Constable recruitment preliminary examination dates on July 9. SI Posts Recruitment Exam would be conducted on 26-08-2018 by 10 am to 1 pm. IT, Communications SI Exam to be conducted on 09-09-2018 by Morning session and Fingerprint Bureau ASI Exam to be conducted on 09-09-2018 by Afternoon session. Police Constable Posts Recruitment exam would be conducted on 30-09-2018. The date for the preliminary written test for Stipendiary Cadet Trainee (SCT) Sub Inspector of Police, Information Technology & Communications and Stipendiary Cadet Trainee (SCT) Assistant Sub Inspector of Police, Finger Print Bureau, which was scheduled to be held on September 2, has been postponed to September 9. The Telangana State Level Police Recruitment Board (TSLPRB) in a press release informed that the preliminary written test date for SCT SI (IT&C) for 13,944 candidates and SCT ASI (FPB) for 7,700 candidates has been rescheduled as the date clashed with the TSPSC recruitment test for the posts of Mandal Planning and Statistical Officer/Assistant Statistical Officer. TSLPRB Chairman VV Srinivasa Rao said in the release that the decision followed requests from some candidates about the clash of examination dates and on verification it was found that more than 1,500 candidates were to appear for both the examinations. The revised examination schedule has the test for SCT SI (IT&C) from 10 am to 1 pm and for SCT ASI (FBP), from 2:30 pm to 5.30 pm on September 9, the release added. The Board has decided to conduct the SI and constable examinations in Hyderabad and 10 important areas of the state. Communications SI and Fingerprint ASI examination will be conducted in Hyderabad and surrounding areas. Decisions have been made to make changes in the application. The changes in personal details are to be sent by email to support@tsprb.in till July 14. 1,88,715 Applicants who applied for the Posts of SCT SI Civil and / or equivalent will be administered the Preliminary Written Test on 26th August from 10 am to 1 pm. 13,944 Applicants who applied for the Post of SCT SI (IT & C) will take their PWT from 10 am to 1 pm on 9th September and 7,700 Applicants for the Post of SCT ASI FPB – from 2.30 to 5.30 pm on the same day. 4,79,166 Applicants for the Posts of SCT PC Civil and / or equivalent will be having their Preliminary Written Test on 30th September 2018.